An old-world respite, just 50 miles from NYC. Mention Cold Spring and a lot of New Yorkers scratch their heads. Sounds familiar, they say, but it soon becomes apparent they’re thinking of Cold Spring Harbor on Long Island, if they’re able to conjure anything at all. Your outdoorsy friends will know what you’re talking about, however; chances are they’ve day-tripped to Cold Spring to hike Breakneck Ridge or to do some kayaking. But you can appreciate this idyllic setting without having to scramble up steep inclines or rent gear and paddle out into the Hudson, and with majestic Storm King Mountain ablaze in shades of yellow, red and orange, late fall is a great time to visit. 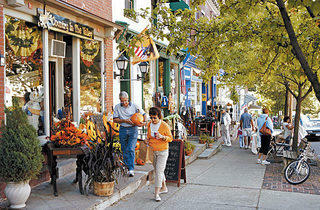 The site of a thriving foundry in the 1800s, this little village is well preserved but laid-back. Stay at the Hudson House River Inn (2 Main St, 845-265-9355, hudsonhouseinn.com; from $155) and enjoy banana walnut pancakes at breakfast in the serene dining room overlooking the Hudson and the mountains. In the afternoon, guests are treated to coffee, tea and yummy homemade cookies. Later, you can sip cocktails in one of the cozy armchairs by the fireplace or in the inn’s Half Moon Tavern. Meanwhile, popovers with strawberry-honey butter and dry-aged steaks are world-famous in the River Room. 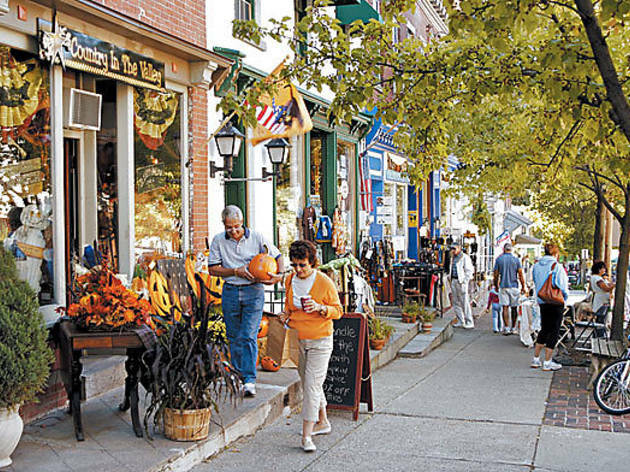 Cold Spring’s Main Street abounds with antiques and collectibles of all kinds. For those who enjoy the hunt, the Cold Spring Antiques Center (77 Main St, 845-265-5050), with more than 20 dealers housed in a 19th-century bank, and Art & Antiques/Downtown Gallery (40 Main St, 845-265-2334), specializing in vintage clothing and art, will provide many hours of blissful foraging. If you’d prefer to limit yourself to one well-edited antique shop, hit Decades (93 Main St, 845-265-9515), an inviting spot showcasing pottery, Depression-era glass, Bakelite pieces, vintage fabrics and handbags. Check out its collection of ’40s and ’50s ladies’ purse accessories, courtesy of a friend of the owner whose father ran a factory that manufactured tiny pillboxes, ashtrays, portable perfume bottles and combs. Step into Archipelago at Home (119 Main St, 845-265-3992) for mirrors hand-painted in Peru, and the store’s own line of scented candles. Fortify yourself mid-spree at the eclectic Foundry Café (55 Main St, 845-265-4504), which serves hearty homemade soups like navy bean with andouille sausage. When you tire of shopping, head to Cold Spring Depot (1 Depot Sq, 845-265-5000). With a horseshoe-shaped bar, an outdoor seating area in warmer weather and a raw bar, this former train station is a popular gathering spot for locals, tourists and a fair share of Harley riders passing through. Settle in with some Guinness potpie by one of two fireplaces, or just enjoy a Dogfish Head IPA on draft before heading up to McGuire’s on Main (54 Main St, 845-265-4853) for a popular, juicy ten-ounce burger in a bare-bones dive-bar setting. If pub grub doesn’t appeal, try Riverview (45 Fair St, 845-265-4778), a low-key favorite serving consistently good New American cuisine in addition to brick-oven pizzas. On November 24, take the self-guided Cold Spring by Candlelight Tour (845-278-PARC, ext 287; putnamarc.org; advance tickets $20, day of event $25), when historic homes and sites will be open to the public, and businesses will be offering discounts and treats like wine and cheese. You can visit The Putnam County Historical Society & Foundry School Museum (63 Chestnut St; 845-265-4010, pchs-fsm.org), where the exhibition “This Perfect River-View: The Hudson River School and Contemporaries in Private Collections in the Highlands” is on view until December 2. Ride the Cold Spring Trolley (Fri–Sun through Dec 16; schedule at coldspringchamber.com) to nearby Boscobel Restoration (1601 Route 9D, Garrison, NY; 845-265-3638, boscobel.org; $12), a restored Federal-home-turned-museum with gardens, apple and quince trees laden with fruit, and a great lawn with sweeping views of the Hudson River. Threatened by a looming teardown, the mansion was packed up and moved 15 miles up the Hudson from its former location to this spectacular setting. On the tour you’ll see great pieces by New York cabinetmakers such as Duncan Phyfe and Michael Allison, while learning about States Dyckman, a Loyalist during the Revolution, who built the dwelling. Afterward, take the trolley to Garrison’s Landing and visit Guinan’s (7 Garrison’s Landing, Garrison, NY; 845-424-3440), the tiny Irish country store and pub that was immortalized in Gwendolyn Bounds’s book Little Chapel on the River. Before boarding a train back to the city, steep in the panoramic view one last time from a bench in Cold Spring’s waterfront park. After watching seemingly toy-size freight trains snake their way down the tracks on the other side of the Hudson and the occasional boat slicing through the river’s shimmering surface, you might be ready to head home. Been somewhere great recently? Tell us where to go at travel@timeoutny.com.